There is a misunderstanding about our relationship to that huge windmill that made it into some of the trustworthiest of travel guides. Even certain people who visited claim our beer is brewed and consumed inside that wooden giant. We recognize the appeal of the idea, but in reality brewery and windmill are two separate entities. 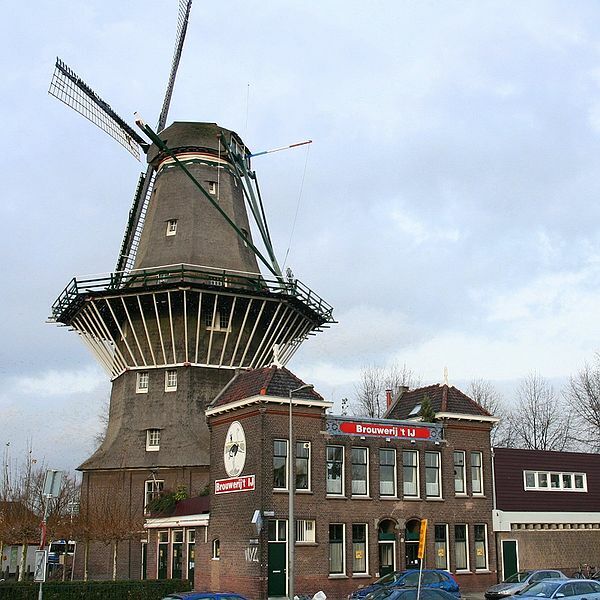 Windmill De Gooyer, as it is called, is been around for a while and has an impressive history, much much longer than that of our brewery. It was build in the 16th century, destroyed and rebuild. It moved whenever urban expansion bereft it of the wind needed to make it an efficient machine. In 1814, the wooden frame was placed on top of the stone walls it still rests on today. As before, it continued to function as a corn mill, up until mid-20th century. It is municipal property today and, unfortunately, not open to the public. Our pub, right next to it, welcomes you every day of the week (from 2pm till 8pm). Come grab a beer and admire the biggest wooden windmill of the Netherlands from our terrace. 6 comments on "De Gooyer: Amsterdams biggest wooden windmill"
Not yet. We will keep you posted. will you be open on christmas day ? Oh yes, from 2 till 8pm, as always. I’d be interested to learn who built the windmill and trace its ownership and history over the generations. I’m told my ancestors once owned this landmark. It would be useful to know whether this is true. Hello Darrell, we wouldn’t know, as the windmill doesn’t belong to us but perhaps the Dutch Windmill Society could tell you more?